The Grandstream GXW-4108 FXO Gateway is a reliable and cost effective solution for businesses looking to improve their communication infrastructure. This Analog Gateway comes equipped with 8 FXO ports. Every one of these ports takes the signal of analog fixed line. The Grandstream offers a lot more than this. It is equipped with two Ethernet RJ45 ports that allow you to use the device as more of a switch. This device is T.38 compliant which allows the user to send and receive faxes. Moreover, it supports some audio conductors notably the G711, G723, G729 and even the GSM. TFTP and HTTP can easily update the firmware. You can update the firmware whether you like. Adding up to the list of features, this device has even video surveillance features that help o the video input port. All That’s Enlightening about It! 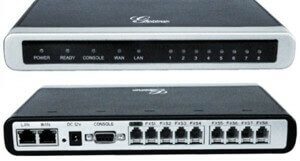 The Grandstream GXW-4108 supports multiple SIP accounts that are linked with Physical line ports. Each of these accounts is corresponding to one of multiple SIP profiles. The device is also well capable of supporting more than one SIP profiles. However, each system can support no more than three profiles a system. This is when the user only hears one dial tone and puts the final destination number with the Prefix. One Stage Dialing needs SIP Server to support SIP Call forward with the help of a dial plan. Two Stage Dialing: This means that after dialing the number, whatever it is, from VoIP to GXW or from PSTN to GXW, a second dial tone makes the user dial in the final destination number to finish final dialing. This device is well capable of acquiring different network settings from the DHCP server to PPPoE. The first thing that needs to be done here allows the device to acquire the network. However, it is better advised to restore the network setting and access the device from another device itself. If you want to configure the network from PPOE, provide the system with your Account ID, password and even the service name, once you are ready, you need to click on the Update button. Now the device will save all these settings and reboot eventually.